"I see him. He stands upon the till, facing the sea. The swell is not so great this morning and the tide pulls upon him. I can see, too, the silver-lined sail, filling now with wind, pulling the little craft into the deeper oceans. Your father is mailed in his silver armour, his great sword, Durendale, strapped to his side. His hair is free now, with no crown banding it. Your father, King no more, is passing away from us. And the Queen saw the craft rise upon a great wave that rose from the ocean's depths. She could see her husband, her one great love, look back, and he smiled. The Evening-Swan then rose over the crest, white foam washing her bow, and slipped into the trough beyond and into Dream. Hazard the Sea of Dreams and find the fables Isle of Blight, the magical resting place of St. Luther. Mysterious stranger, fiendish creatures, and other-wordly magics stand between the adventurers and the once and future king. Can they cure his malady and bring peace to the spirit of his Queen? 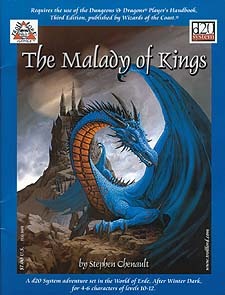 The Malady of Kings is a d20 System adventure for 4-6 characters of levels 10-12. Set in the World of Erde, it expands upon the legends and history of the After Winder Dark Fantasy Campaign Setting. Inside you will find further details on the Kingdom of Kayomar, the fall of the royal family of Pendegrantz, Daladon Lothian and the Watchers in the Wood, the madness of the White Mage, and the Troll Lord himself.